Popular Household Knives Most homes have a lot of knives and they are not just in the kitchen. 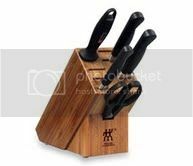 You may have a chef knife set along with a random assortment of kitchen cutlery but you may also have everything from pocket knives, hunting and fishing knives along with things like a utility or box knife, a hot knife for sewing and crafts and even a knife for cutting Styrofoam or other craft materials. Knives have been around since man first started working with tools and the materials involved in crafting knives are quite diverse. Most knives are made of metal but there are also knives made of ceramic, glass and even plastic – if you’ve ever used a plastic pumpkin carving knife you know how handy they can be. Fans of a hot knife know that cutting polyester and other synthetic fabrics is a breeze; when you have the right tool for the job the work becomes easier and more pleasurable and that is especially true when it comes to preparing and serving food. Slicing tomatoes can be a hassle, especially when they are ripe – no doubt you’ve experienced the mess of a tomato skin that bends but does not break and the splash of tomato seeds and pulp when the knife finally cuts through the tomato. The end result is wasted food and a messy kitchen. When you invest in a serrated edge tomato knife it’s so much easier to slice and serve even the ripest tomatoes effortlessly. The same holds true for paring vegetables and fruits – a good paring knife is worth its weight in gold when it’s well designed and easy to use. There are many ergonomically designed paring knives specifically designed to make work effortless and enjoyable.